Currently on special from Bayside Steel Building , the Aussie Barn Designs will suit 2 stables and a breezeway area to tack up and grooming horses out of the weather. The Aussie Barn Designs are also ideally suited for those wanting a smaller stable complex to have them modified or extended later or those looking for a storage area for a semi rural block that add value to a site. 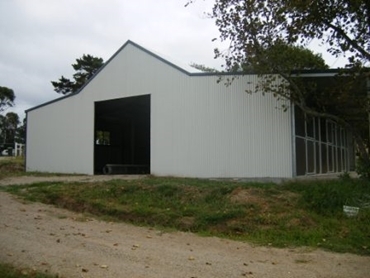 All main columns in the Aussie Barn Designs are made from galvanised pre-punched and bolted main frame and full colourbond roof, walls, flashings, trims and accessories. They also includes gutter and PVC round downpipes and Baysyde’s standard engineering and signed structural design certificate. 30 deg centre breezeway pitch with 5 deg roof pitch awning to one side. complete kit, delivered to site.Comes with detailed installation drawings, bill of materials for ease of own installation.